2015년 12월에 구상, 작년 초가을 본격 추진했던 중요한 프로젝트 하나를 이번 한국 방문 기간에 맞추어 마무리합니다. 새로 나오는 <안티 젠트리피케이션, 무엇을 할 것인가>를 기념하기 위해 저자들을 모시고 두 번의 행사를 갖습니다. 이번 출장 동안 미처 찾아뵙지 못하고 연락도 제대로 못드린 점 너그러이 이해해주시길 부탁드리며, 시간 되시는 분들은 두 행사장 모두 또는 한 군데에서 뵐 수 있으면 좋겠습니다. 주변에 널리 알려주시길 부탁드리며, 책에도 관심 가져 주시길 부탁드립니다. 목차도 아래에 첨부합니다. I am organising a book talk and a book symposium to mark the publication of an edited volume (in Korean), which I have been working on since last year. It’s entitled <Anti Gentrification: What is to be done>. 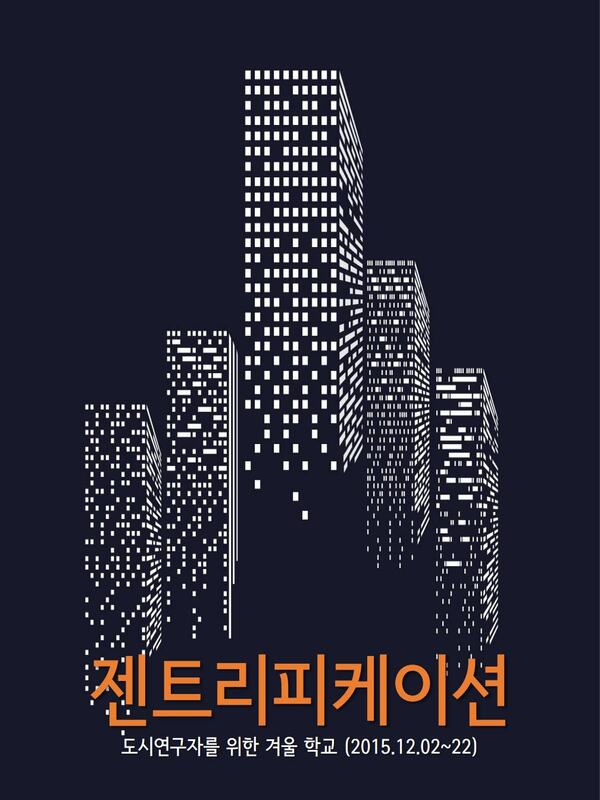 Great to see the publication of my chapter “Envisioned by the state: Entrepreneurial urbanism and the making of Songdo City, South Korea” in this new edited volume Mega-urbanization in the Global South: Fast Cities and New Urban Utopias of the Postcolonial State, edited by . In: Ayona Datta and Abdul Shaban. I look forward to receiving its printed copy. For viewing the Word version and its download, please click here. So much has been said about Songdo City in recent years in both academic and practitioner circles. International media has also taken part to inflate the reputation of Songdo City, hailed initially as an eco-city, then as a ubiquitous city (or U-city) and now a smart city (Shwayri, 2013; Shin, Park and Sonn, forthcoming; Kim, 2010). The New York Times went even further to dub it “Korea’s High-Tech Utopia” (O’Connell, 2005). Sometimes its own promotional material puts all these together and simply refers to Songdo as an eco-friendly ubiquitous smart city (IFEZ Authority, 2007). Governments elsewhere see Songdo as a reference for their own mega-projects to create a brand new city from the scratch (see El Telégrafo, 2012 for example on the construction of Yachay City in Ecuador). However, Songdo has come to cater exclusively for the needs of domestic and global investors as well as the rich who have financial resources to grab upmarket real estate properties. It may indeed be an urban utopia, built on a reclaimed tabula rasa and promoted by the state, merging together technological innovation, fixed assets investment, real estate speculation and financialisation, for exclusive use of the rich and the powerful. 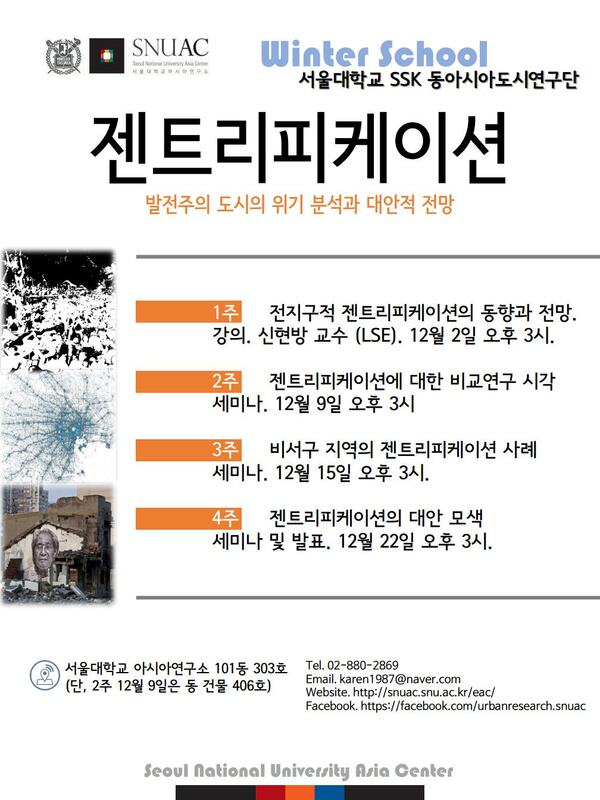 In December 2015, I will be leading a series of seminars in Seoul on gentrification. This is to take place at Asia Centre, Seoul National University once a week and starting on 2 December. Gentrification has recently become a social and politically hot topic in Seoul, having seen frequent media coverage from late last year and politicians producing various policy proposals in recent weeks to address displacement of original residents and in particular small businesses who are being driven away due to hiking rents. All those in Seoul and interested in the topic are welcome. Please be reminded that the sessions will be run in Korean though. 젠트리피케�?�션 발전주�?� �?�시�?� 위기 분�?과 대안전�? 지난해부터 언론�?� 통해서 젠트리피케�?�션 용어가 빈번하게 언급�?�고 있습니다. �?�미롭게�?� 최근 한 대중가수가 공중파 예능프로그램�?서 �?� 용어를 언급한 사실�?� 한국사회�?서 젠트리피케�?�션 현�?�?� �?드러지게 나타나고 있�?��?� 보여주는 척�?�입니다. �?�처럼 대중�?� �?��? �?�?서 젠트리피케�?�션 현�?�? 대한 관심�?� 확산�?�고 있지만, 정작 현�?�? 대한 기본�?�?� 정�?�나 학술�?�?� 토론 �? 연구는 아�? 제대 로 진행�?�지 못하면서 용어�?� 사용과 현�?�? 대한 �?�해�? 있어서 혼란�?� 빚고 있습니다. �?�러한 �?황 �?서 전지구�? 젠트리피케�?�션 논�?�를 소개하고, 우리 사회�?� 젠트리피케�?�션�?� 검토하기 위해 본 겨 울학�?를 기�?하였습니다. 본 프로그램�?� 네 번�?� 모임으로 �?�루어진다. 첫 번째 모임�?서는 LSE 신현방 �?수가 젠트리피케�?�션 �? 대한 개론�? 소개 �? 앞으로�?� 세미나 방향�?� 짚어�?니다. 전지구�? 젠트리피케�?�션�?� �?�향과 전�? �?��?�는 주제로 강�?�와 토론�?� 펼칠 예정입니다. �? 번째 모임부터는 본격�?으로 참�?�?들�?� 젠트리피케�?�션�? 대한 해외최신연구들�?� �?�고, 토론하는 리딩(reading) 세미나 방�?입니다. �? 번째 모임�?서는 현재 젠트리피케�?�션 논�?��?서 국가별, �?�시별, 지역별로 어떤 차�?�와 공통�?�?� 있는지를 살펴본다. 세 번째 모임�?서는 기존�?� 서구�?�시 중심�?� 연구 �?� �?��?�를 받아들�?�면서�?� 탈서구�?�?� 시�?�?서 아시아 �?�시 사례들�?� 살펴봅니다. �? ?으로 네 번째 모 임�?서는 실천�?, 정책�? 측면�?서 젠트리피케�?�션�? 대한 대안�? 혹�?� 대항�?�?� 실천과 방향�?� 논하 는 것으로 �?국�?� 사례를 살펴보고, 한국 젠트리피케�?�션�? 대한 짧�?� 발표를 들�?� 예정입니다. 세미나�?� �?��?�거리는 대부분 �?문논문들�?��?�서 �?�반�?�들�?게는 발제�? 대한 부담�?� 있�?� 수 있지만, 세미나�?� 주제가 현실 �?��?과 매우 밀접하게 결부�?�어 있는 만�?� 발제는 연구�?, 대학�?�? 중심으로 하면서 참�?�?� �?��?� 넓히고�? 합니다. 본 겨울학�?를 기�?한 SSK �?�아시아 �?�시 연구단�?� “발전주�?� �?�시화�?�?�는 화�?를 잡고서 어떻게 한 국�?� �?�시�?서 국가 주�?��?� �?�시화 과정�?� 진행�?�었고, 민주화, 세계화, 신�?유주�?�화, 경제위기�? �?면 하여 �?�시가 변형�?�었는지를 연구하고 있습니다. �?�러한 문제�?��? 위�? �?�번 겨울학�?는 보다 정�?�롭 고 �?�용�?�?� 탈발전주�?� �?�시화로 나아가는 경로를 실천�?으로 모색하려는 시�?�입니다. �?� 프로그램�?� 취지와 젠트리피케�?�션 논�?��? 관심 있는 분들�?� 많�?� 참여를 기다립니다. Smith, N. and Williams, P. (1986) Gentrification of the City. London: Unwind Hyman. Chapter by Neil Smith on “Gentrification, the frontier, and the restructuring of urban space�?, and Chapter by Pete Marcuse on “Abandonment, gentrification, and displacement: the linkages in New York City�? Lees, L., Shin, H.B. and E. López-Morales. (2015) “Conclusion: global gentrifications�? in Global Gentrifications: Uneven development and displacement. Policy Press. : 441-452. López-Morales E (2015) Gentrification in the global South. City 19(4): 564-73. Ghertner A (2015) Why gentrification theory fails in ‘much of the world’. City 19(4): 552-63. Back in 2008, I had a paper published in the journal, Environment and Urbanization. It discusses the effectiveness of public rental housing provision as compensation measures for tenants in substandard neighbourhoods which become subject to wholesale demolition and redevelopment. I argue in the paper that while the provision of public rental housing provision is a step forward for addressing housing problems of the urban poor, it cannot be all-encompassing solution, and that compensation needs to take into account the diverse socio-economic circumstances (including tenure preferences) of the urban poor.